Do I like wearing sunscreen? No. Do I wear sunscreen every single day? YES. What happens if I don’t wear sunscreen every single day? To begin with, 80% signs of ageing (like fine lines, hyper-pigmentation, wrinkles and sagging) are accelerated by the sun’s rays, which penetrate deep into the skin to attack collagen – the spongy protein that keeps skin supple and firm. More importantly, your risk for skin cancer increases every time you peel. Five sunburns doubles your risk for melanoma. And that’s not all. 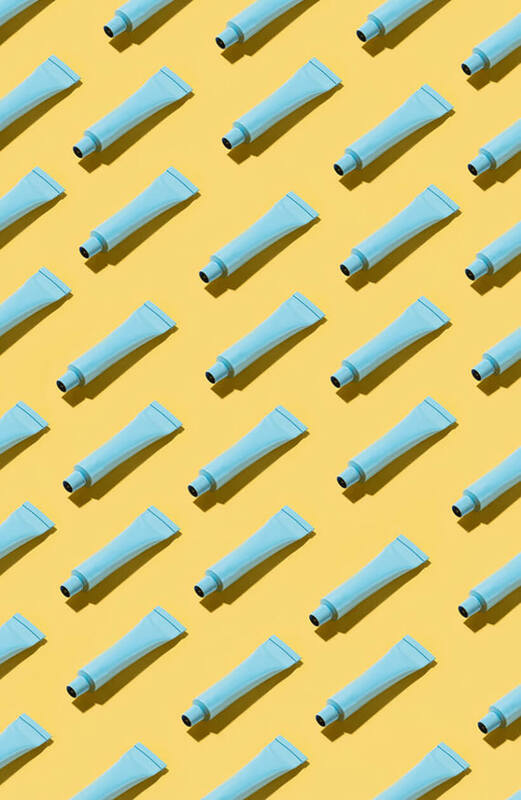 Regular SPF use allows skin cells to focus on tasks that actually improve skin – such as shedding dead cells and building collagen – rather than on fighting environmental effects. So you not only prevent further damage, but actually get repairing benefits as well. So, yes… even though I have yet to find someone who actually enjoys wearing sunscreen, there’s really no alternative. 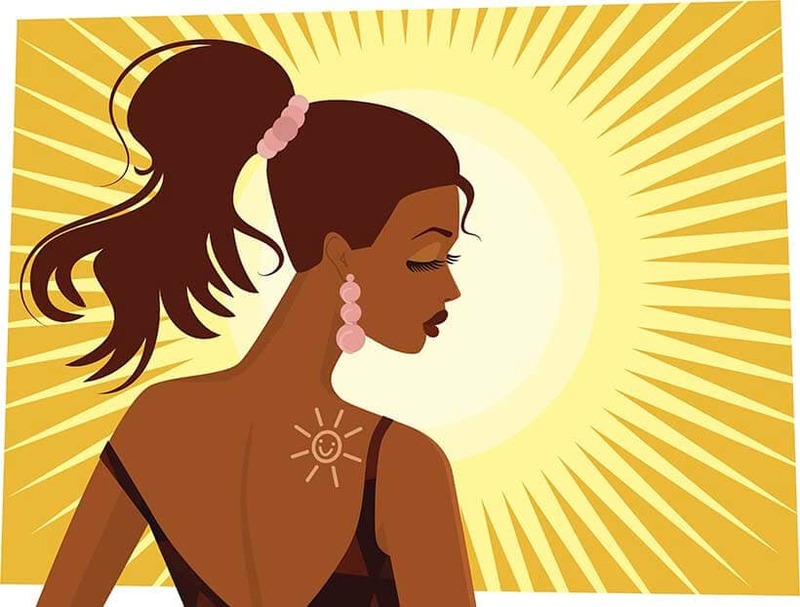 Even people with dark skin tones still need sunscreen as the deepest melanin only rates an SPF 2 protection from UVB rays. It offers no protection against UVA rays or free radicals. Which brings us to the next question: Which sunscreen should I choose? Physical or chemical? What’s the difference? And are there any health risks? For my money, after everything I have read and the experts to whom I have spoken, my go-to is now a physical sunscreen with zinc oxide. Let me explain. Physical vs chemical sunscreen: What’s the difference? Physical sunscreens (also known as mineral sunscreen or sunblock) contain active mineral ingredients – usually zinc oxide or titanium dioxide. These work by sitting on top of the skin and creating a physical barrier that blocks and scatters UV rays even before they penetrate the skin. Chemical sunscreens contain compounds like mexoryl, oxybenzone, avebenzone, octocrylene, octinoxate, octisalate, homosalate, helioplex and Mexoryl, which work like a sponge by absorbing UV rays into the skin. Once absorbed, they change the UV rays to heat (a less harmful form of energy), then release them through the skin. So, is it the same as organic vs inorganic sunscreens? Sunscreens are one area where the term “organic” is not all that it seems. And some unscrupulous brands play on this to mislead the consumers. Here, it’s the chemical sunscreens that are referred to as “organic” by science… not because they are “natural” but simply as they contain carbon-carbon bonds. Physical sunscreens, on the other hand, are “inorganic” as they don’t contain any carbon bonds. Because physical sunscreen sits on top of your skin, it does not enter your bloodstream. Chemical ones, on the other hand, need to enter your bloodstream in order to work efficiently. Considering that ingredients like OxyBenzone have been detected in breast milk and blood for up to five days after application, I am hesitant to let them near my body. Especially since certain ingredients may actually precipitate DNA damage upon sun exposure and become carcinogenic. And they have been found to disrupt hormones. That’s quite a scary cocktail! Chemical sunscreens go under your skincare, as they need to sink into the skin. They also take about 20 minutes to work (since the ingredients need to be absorbed), so you can’t slap on and step out of the door immediately. Physical sunscreen goes on top of your skincare, just under makeup. They start protecting you immediately, so there’s no waiting time required! “Effective” is actually too broad a term, made up of various variables like SPF, specific ingredients and longevity. Physical sunscreens with zinc oxide, however, are naturally broad spectrum, which means they protect against both UVA and UVB rays. Titanium dioxide protects against UVB rays, but not the full spectrum of UVA rays (one of the reasons why I prefer zinc oxide). Chemical sunscreens can also be broad spectrum but you will have to specifically check for the rating on the label. They also start breaking down more quickly in the sun, thereby requiring more constant reapplication. This is one place where chemical sunscreens score big. Physical sunblock tends to sweat and rinse off easily, not making it the best option for a day of swimming or water sports. Chemical versions, however, work better here as they sink into the skin and won’t come off so easily. If, like me, one of your main reasons for slapping on sunscreen is to avoid hyper pigmentation, physical blockers may be a better idea. Chemical sunscreens can make the skin heat up internally (in order to transform and disperse the UV rays), thereby increasing brown spots and discoloration. Since chemical sunscreens are not very photostable, they can amplify free radical formation on contact with UVA rays. So, if you are going the chemical route, use a good antioxidant serum with your sunscreen for maximum protection against oxidative damage. If you’ve ever felt your eyes sting after using a sunscreen, it’s more likely due to a chemical filter. 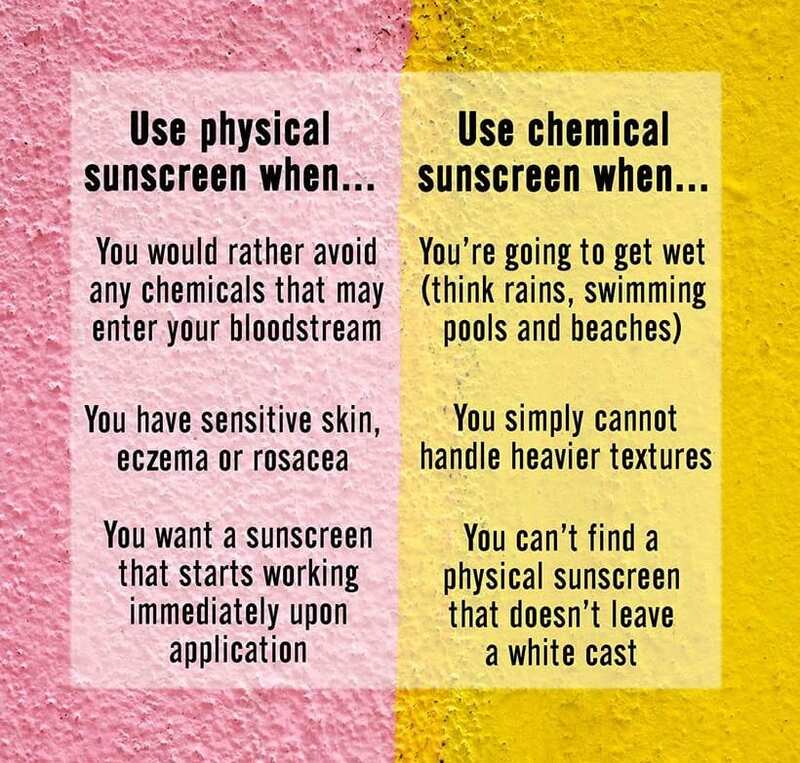 Similarly, chemical sunscreens are more likely to trigger unwelcome skin reactions like contact dermatitis and photosensitivity, since multiple active ingredients have to be combined to get broad spectrum coverage. Another big one: People with rosacea-prone skin have increased chances of a flare-up with chemical sunscreens as they change UV rays into heat, which can exacerbate flushing. On the other hand, zinc oxide is also an anti-irritant and skin protectant, and is commonly used in sensitive skin care lines. In fact, Neutrogena’s Sheer Zinc Sunscreen Lotion SPF 50 even has the National Eczema Association’s stamp of approval. Titanium dioxide comes in a close second, though could be a problem for those who are sensitive to mineral makeup. Ah! The big one. This is the main reason people opt out of using a physical sunscreen: The mineral particles tend to create a white cast on the skin. Plus, zinc oxide and titanium dioxide are thicker and take some more effort to rub in. Chemical sunscreens, on the other hand, have a lighter texture, are more easily spreadable and don’t give off that ghosting effect. Not necessarily, since physical formulas are constantly improving, becoming more lightweight and less whitening. One of the main advances is in the field of micronisation, which means the particles have been made much smaller to minimize the white cast. One of my personal favorites is the Drunk Elephant Umbra Sheer Physical Daily Defense Broad Spectrum Sunscreen SPF 30, with 20% zinc oxide, which gives a natural glow. The Avène Mineral Ultra-Light Hydrating Sunscreen Lotion SPF 50+ and La Roche-Posay Anthelios 50 Mineral Ultra Light Sunscreen Fluid are two other physical sunscreens with a super-light texture and no white cast. Several formulas have moved even beyond micronisation to nanoparticles (tiny particles of zinc oxide between one and 100 nanometres), which allow the formula to be texturally lighter and more transparent. As for the debate about the safety of nanotechnology? Several bodies, including the Environmental Working Group, have shown that nanoparticles in sunscreen don’t go beyond the outer dead layers of skin, and do not penetrate the skin or cause damage. What’s your take on chemical vs. physical sunscreens? Which do you prefer? Wondering what are your thoughts on baby sunscrens for adults? I recently moved from chemical to physical ones too. I ordered blue lizard for my baby and I am hooked! I am of the opinion that chemical sunscreen are much better when it comes to protect skin . I use La prairie spf or La Mer reparative skintint spf 30. They not only protect skin from collagen damage but makes it luxuriously smooth , bright,silky and healthy . Physical sunscreen looks gross , smells cheap and gives acne and various skin ailments .